Are you ready for the future of precision agriculture drones? UAVenture of Aarau, Switzerland and Aerotenna of Lawrence, KS, U.S.A are proud to announce Precision Spray Autopilot, a complete autopilot system purpose-built for agricultural spraying applications. The bundle is built with agriculture drone manufacturers and service providers in mind, it enables agriculture drones to fly fully autonomously and allows better spray management with planning and real-time monitoring. The manufacturers and service providers can finally focus on their core agriculture business. The revolutionary new Precision Spray Autopilot is a simple plug-and-play solution, allowing quick and easy integration into your existing multirotor spraying drones. It includes the Aerotenna OcPoC flight controller, powered by UAVenture AirRails Crop Sprayer firmware, an Aerotenna µLanding altimeter, and AirRails Ground Control Station Crop Spraying edition for Android. The Precision Spray Autopilot supports the ability to fly a fully autonomous spraying mission at the touch of a finger. 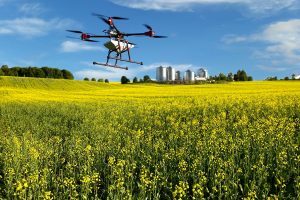 It also enables agriculture drone manufacturers and spray service providers to fly semi-autonomous missions with simple control over their spray rates and auto lane switching. “We’re so excited to work with Aerotenna to bring the cutting-edge bundle to the market. We are confident this solution will leapfrog the precision agriculture to the level of fully autonomous, and highest precision planning and execution. “ says Simon Wilks, Co-founder of UAVenture AG. “Aerotenna is proud to extend our high performance µLanding altimeter and advanced OcPoC flight controller to precision agriculture markets. With it’s deep industry knowledge and field experience, UAVenture is a great partner to work with in bringing the solution to the market. “ says Zongbo Wang, Co-Founder of Aerotenna.